Lagos, the most populated and the most economically buoyant city in Africa, is a place of so many beauties that one would be confused of which to visit. The city is located right by the Atlantic Ocean, thus there are various beaches in Lagos, in various parts. With a wide array of beaches to choose from in the coastal city of Lagos, it may be a little confusing to decide which to visit. Not to worry, here’s a list of the top beaches in Lagos to help you make a choice. The most popular of the private beaches in Lekki, Lagos. Elegushi Royal Beach, a private beach owned by the Elegushi Royal family, led by HRM Oba Alayeluwa Saheed Ademola Elegushi. The beach is well known to be the go-to fun place for great meals, nightclubs, and hang out spots. This beach is the perfect spot for picnics, parties or social gatherings. On getting to the beach, you’ll be required to pay an entry fee of N1,000 after which you might be requested to pay an extra N200 for parking, but trust me, it’s worth every penny spent. When you think about private beaches in Lagos, Atican Beach Resort is the first that should come to mind. 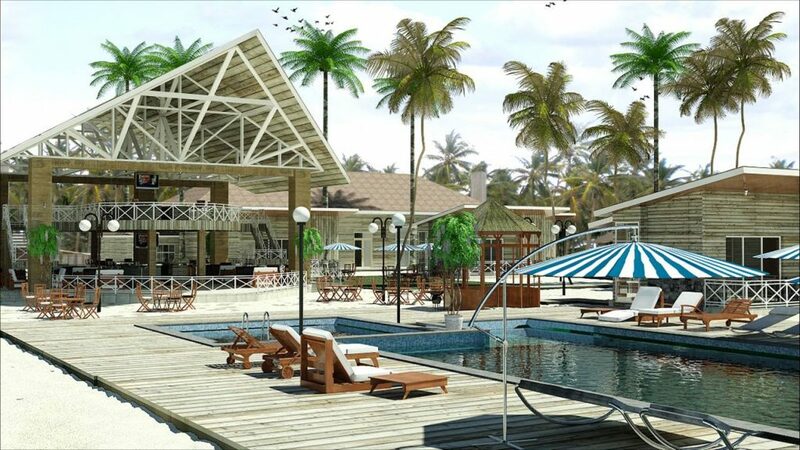 Atican Beach resort, one of the prestigious beaches in Lagos is a pristine ocean-side destination in Lekki. The private beach resort is a centre for fun and relaxation. Its clean white sand and beautiful Carribean style layout make it a great destination for romantic getaways, group hang out and family outings. It has lodges and a restaurant too! Located in Lekki, Eleko Beach offers a peaceful retreat for privacy seeker or couple’s looking to enjoy a good time away from the hustle of Lagos. This public beach is one of the lush beaches in Lagos, located close to La Campagne Tropicana. It offers private beach features such as bamboo huts. It also less rowdy than other public beaches in Lagos and considered to be cleaner. Tarrkwa Bay Beach is one of the beaches in Lagos where you can be assured a great time. A sheltered beach located near the Lagos Harbour. It’s a popular with swimmers and water-sports enthusiasts, also home to a welcoming resident community. One the most beautiful and serene private beaches in Lagos owned by the Oniru Royal Family. Oniru beach is one of the most sort-after beaches in Lagos because of its serenity and neatness. This beach is located on Victoria Island. It’s a popular venue for parties, live shows, and special events. When you visit Oniru Beach, ensure you are ready to have a good time and make wonderful memories. This is the best-kept secret for fun and adventure till now! Halemson beach resort is situated on an exclusive beach over-viewing the Atlantic Ocean on the Nigerian coastline in Lagos. The beach is about a thirty-minute boat cruise from Victoria Island and a ten-minute boat cruise from Satellite Town waterside. Located by land, from Mile 2 up to Satellite town (Ijegun water side), Badagry Expressway and by boat through Badagry, Apapa, and Victoria Island waterways, the resort provides pick-up services at specified pick-up points. It is quiet and reserved, and one of the safest beaches in Lagos. It was founded on the desire to provide an atmosphere for individuals, groups, families, and corporate bodies who long for a natural, quiet, and peaceful atmosphere, which the fast pace Lagos city life cannot provide. The resort is not just for the cool and calm as fun seekers are very well provided for too. Fully equipped with several indoor and outdoor recreational facilities such as a tennis court, badminton, ludo, chess, bikes for riding, card games, rope climbing exercises, monopoly, darts, a basketball court, volleyball, a football field and even a golf bunker. So if you’re looking to have fun during your “away” time, here is the place to be. Other interesting activities are carried out like fishing, sailing, canoeing, boating, and surfing. So residents at the resort can involve themselves in any of the activities that pique their interests. The resort also provides fitness training lessons and massage lessons. The accommodation provided is one of comfort and style and the restaurant and bar are one with class.The restaurant and bar are located in a very spacious hut made from local materials, giving a more natural feel to the environment. This hut is also used for social gatherings, meetings, and clubbing at nights. 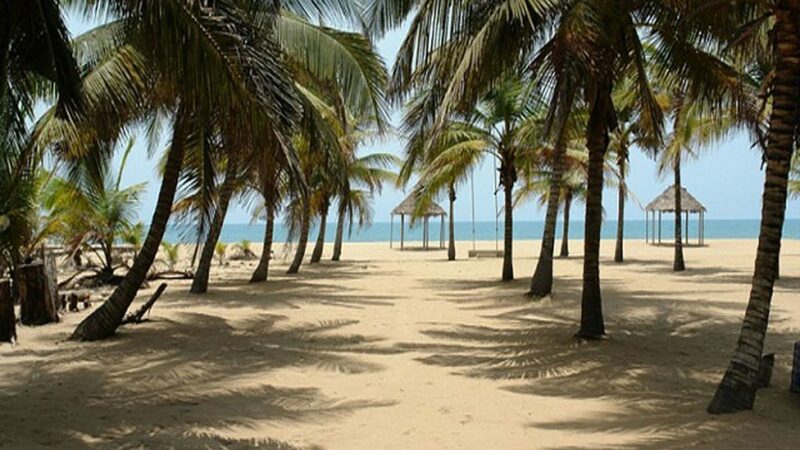 Located west of Lagos in the coastal town of Badagry and about twenty miles towards the Nigerian border and the Republic of Benin lies the Coconut Beach, aptly named for the coconut trees that surround the beach. The coconut beach is a nice place to relax from the hustle and bustle living in Lagos brings. Accessible through Lagos-Badagry expressway, Coconut Beach is surrounded by holiday resorts where visitors could refresh while on the beach. With the kind of tropical sun that could be enjoyed within the environment, the Coconut Beach is an ideal destination for lovers of fun and holidaymakers. It is a perfect spot for enjoying the ocean breeze or watching the waves race and rise against the pebbled sands of the beach at any time of the day. Tall coconut trees form a bewitching scenery. There is music, fun during weekends, holidays and the yuletide season. The view of the Coconut Lake also gives off a romantic vibe. While at the coconut beach, enjoy the serenading atmosphere, play water sports and ride horses.